Buy a Wado-Kai Aikido calligraphy wall scroll here! This is the title for Wado-Kai Aikido. Wado-Kai is used as a title for styles of Karate and Aikido. Breaking down the characters into the proper Japanese Romaji, you have "wa dou kai" or "wa dō kai." The meaning is roughly-translated as "Harmony Way Club" or "Peace Method Association." The first Kanji should probably be read as harmony, rather than peace in this case. Not the results for wado-kai aikido that you were looking for? A cover, anything that screens, hides, or hinders; to build; then, for. The passions which delude the real mind so that it does not develop. A hat, or umbrella, or any cover. The canopy over a Buddha. Gigantic, monstrous, part man part devil; a puppet. 回 To turn, revolve, return. ; Return, turn back, a turn. An official building; a monastic granary; 廨院主 the head of it. 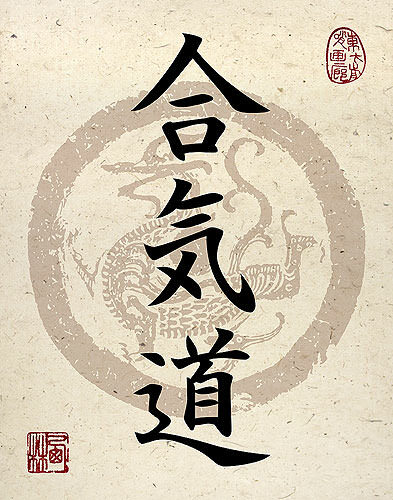 Some people may refer to this entry as Wado-Kai Aikido Kanji, Wado-Kai Aikido Characters, Wado-Kai Aikido in Mandarin Chinese, Wado-Kai Aikido Characters, Wado-Kai Aikido in Chinese Writing, Wado-Kai Aikido in Japanese Writing, Wado-Kai Aikido in Asian Writing, Wado-Kai Aikido Ideograms, Chinese Wado-Kai Aikido symbols, Wado-Kai Aikido Hieroglyphics, Wado-Kai Aikido Glyphs, Wado-Kai Aikido in Chinese Letters, Wado-Kai Aikido Hanzi, Wado-Kai Aikido in Japanese Kanji, Wado-Kai Aikido Pictograms, Wado-Kai Aikido in the Chinese Written-Language, or Wado-Kai Aikido in the Japanese Written-Language. 4 people have searched for Wado-Kai Aikido in Chinese or Japanese in the past year.